1 David again brought together all the able young men of Israel—thirty thousand. 2 He and all his men went to Baalah[a] in Judah to bring up from there the ark of God, which is called by the Name, the name of the Lord Almighty, who is enthroned between the cherubim on the ark. 3 They set the ark of God on a new cart and brought it from the house of Abinadab, which was on the hill. Uzzah and Ahio, sons of Abinadab, were guiding the new cart 4 with the ark of God on it, and Ahio was walking in front of it. 5 David and all Israel were celebrating with all their might before the Lord, with castanets, harps, lyres, timbrels, sistrums and cymbals.6 When they came to the threshing floor of Nakon, Uzzah reached out and took hold of the ark of God, because the oxen stumbled. 7 The Lord’s anger burned against Uzzah because of his irreverent act; therefore God struck him down, and he died there beside the ark of God. 8 Then David was angry because the Lord’s wrath had broken out against Uzzah, and to this day that place is called Perez Uzzah. 9 David was afraid of the Lord that day and said, “How can the ark of the Lord ever come to me?” 10 He was not willing to take the ark of the Lord to be with him in the City of David. Instead, he took it to the house of Obed-Edom the Gittite. 11 The ark of the Lord remained in the house of Obed-Edom the Gittite for three months, and the Lord blessed him and his entire household. 12 Now King David was told, “The Lord has blessed the household of Obed-Edom and everything he has, because of the ark of God.” So David went to bring up the ark of God from the house of Obed-Edom to the City of David with rejoicing. 13 When those who were carrying the ark of the Lord had taken six steps, he sacrificed a bull and a fattened calf. 14 Wearing a linen ephod 2, David was dancing before the Lord with all his might, 15 while he and all Israel were bringing up the ark of the Lord with shouts and the sound of trumpets. 16 As the ark of the Lord was entering the City of David, Michal daughter of Saul watched from a window. And when she saw King David leaping and dancing before the Lord, she despised him in her heart. 17 They brought the ark of the Lord and set it in its place inside the tent that David had pitched for it, and David sacrificed burnt offerings and fellowship offerings before the Lord. 18 After he had finished sacrificing the burnt offerings and fellowship offerings, he blessed the people in the name of the Lord Almighty. 19 Then he gave a loaf of bread, a cake of dates and a cake of raisins to each person in the whole crowd of Israelites, both men and women. And all the people went to their homes. The ark had struck terror among the Philistines after they captured it from Israel (1 Samuel 5-6). Later some in the vicinity of Bethshemesh found it equally lethal (1 Samuel 6:19-21). It eventually was housed in Kiriath-Jearim for at least twenty years under the care of Eleazar, son of Abinadab (1 Samuel 7:1). When David begins to move it, the sons of Abinadab, Uzzah and Ahio, guide the ox-drawn cart. Theologians have long sought to rationalize the death of Uzzah with speculation about what he did wrong. Yes, the ark was sacred and not to be treated with indifference or handled improperly. But did Uzzah’s individual carelessness reach the same level of Ananias and Sapphira (cf. Acts 5:1-11)? 3 Or is David somehow at fault too? The failures of leaders often impact those with less power. David learns that as the Lord can burst out against the Philistines (5:20) as well as burst out within Israel (6:8). In the short term, Uzzah pays most for the lesson. In other words, David’s motives may not pure and yet God is involved. David thought that he was doing the right thing, giving honor to the Lord. He wanted all the Israelites to worship the Lord again. But the Lord had stopped the procession. David became angry. Then David realized how holy God really was and became afraid of the Lord. He did not want the Lord to punish any more people. David did not know whether the ark would ever go to Jerusalem. David would not have given the ark to an ordinary Israelite. The Levites knew how to look after the ark in the proper way so the ark ended up in the care of Obed-Edom . For three months the Lord blessed everything that Obed-Edom had. David realized that the ark itself was not the problem. The Lord had only been angry because Uzzah had done something wrong. He had touched the ark. But then, the Lord blessed everyone who gave Him honor. The problem was that David’s men had carried the ark in the wrong way. They had not obeyed the Lord. This time they carried it as the Lord had said. And they sacrificed to the Lord. David wore a linen ephod to show humility. In what ways do you think God still renders His judgement in our world? – How can we tell it is God, and not just an act of coincidence? How does the world learn the proper ways to behave before their God? What is the evidence of proper behavior? David was sinful before God – David was righteous and faithful before God: how to you reconcile God’s love of David and God’s blessings on Israel? 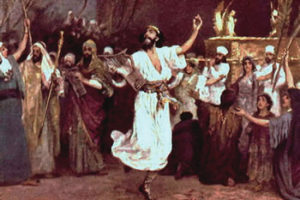 The people of Israel danced two different times, the first time was not pleasing to God. What was the difference the second time? 14 King Herod heard about this, for Jesus’ name had become well known. Some were saying, “John the Baptist has been raised from the dead, and that is why miraculous powers are at work in him.” 15 Others said, “He is Elijah.” And still others claimed, “He is a prophet, like one of the prophets of long ago.” 16 But when Herod heard this, he said, “John, whom I beheaded, has been raised from the dead!” 17 For Herod himself had given orders to have John arrested, and he had him bound and put in prison. He did this because of Herodias, his brother Philip’s wife, whom he had married. 18 For John had been saying to Herod, “It is not lawful for you to have your brother’s wife.” 19 So Herodias nursed a grudge against John and wanted to kill him. But she was not able to, 20 because Herod feared John and protected him, knowing him to be a righteous and holy man. When Herod heard John, he was greatly puzzled; yet he liked to listen to him. 21 Finally the opportune time came. On his birthday Herod gave a banquet for his high officials and military commanders and the leading men of Galilee. 22 When the daughter of Herodias came in and danced, she pleased Herod and his dinner guests. The king said to the girl, “Ask me for anything you want, and I’ll give it to you.” 23 And he promised her with an oath, “Whatever you ask I will give you, up to half my kingdom.” 24 She went out and said to her mother, “What shall I ask for?” “The head of John the Baptist,” she answered. 25 At once the girl hurried in to the king with the request: “I want you to give me right now the head of John the Baptist on a platter.” 26 The king was greatly distressed, but because of his oaths and his dinner guests, he did not want to refuse her. 27 So he immediately sent an executioner with orders to bring John’s head. The man went, beheaded John in the prison, 28 and brought back his head on a platter. He presented it to the girl, and she gave it to her mother. 29 On hearing of this, John’s disciples came and took his body and laid it in a tomb. Herod was Herod Antipas, a son of Herod the Great. He ruled Galilee and Perea. Although Mark calls him ‘king’, the Romans would not let Herod use that word about himself. People believed that Elijah would come to announce the arrival of the Messiah (Malachi 4:5). Some people believed that John was a prophet because he spoke with authority. Herod had first married the daughter of king Aretas, who ruled a country in Arabia (2 Corinthians 11:32). But he left her and he married Herodias. She was the wife of his half brother Philip. They were both sons of Herod the Great but they had different mothers. Salome was the daughter of Herodias. John had said that Herod was wrong to marry Herodias. She could not forgive John for that. She wanted Herod to kill John. She persuaded Herod to put John in prison at the castle of Machaerus near the Dead Sea. Herod was afraid of John, but he respected him. He recognized that John was a good man. He hated John’s message, but he could not stop listening to John. He tried to protect him from the anger of Herodias. Herodias encouraged Salome to dance alone in front of Herod and his guests. It is possible that Harod had drunk too much wine. He promised Salome anything that she asked for without thinking about what she might ask. He could not give Salome ‘half his kingdom’, because he only ruled with the authority of the Romans. But he made his promise sound very serious. We have two stories about dances, one blessed by God and two probably not – What are all of the differences that you see between them? In both our stories, old and new testaments, God sees the “Truth of the Heart.” If this is the nature and power of our God, why do people, even Christians, try to deceive? How do you think God would like to see Joyful Dancing used to celebrate His love for us and character? In what way does pride destroy a person’s character? Use both Harod and David as examples. In what way should the Christian Church celebrate joyfully? What is appropriate and what is not?